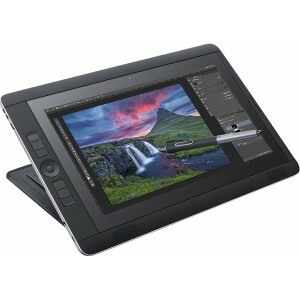 Be more productive with this Wacom Cintiq tablet. It has Windows 8.1 Pro installed for professional tasks and a powerful Intel Core i5 processor for faster response times. It comes with an adjustable stand, so you can stream movies during work breaks. 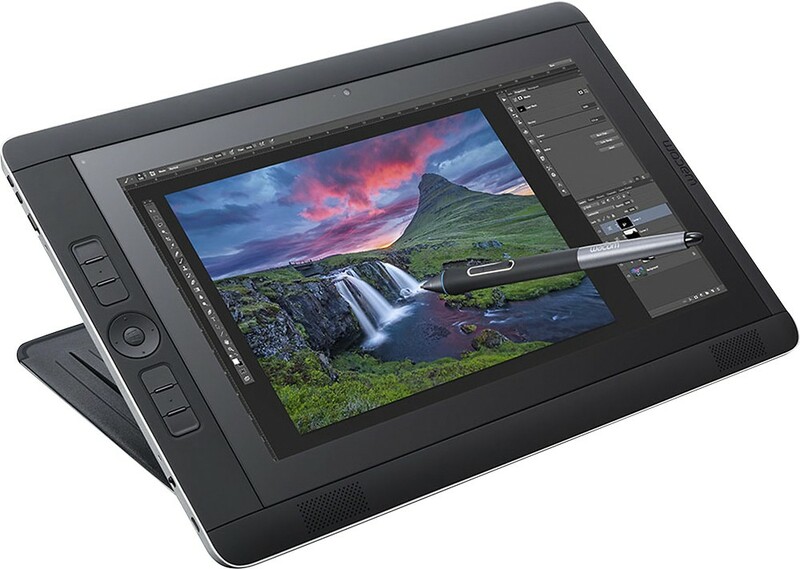 This Wacom Cintiq tablet has a 128GB hard drive for ample storage. Windows 8.1 operating system preinstalled Customize your home screen with instant access to the things you care about most, or restore the familiar Windows desktop experience with an improved taskbar and streamlined file management. 13.3" multitouch screen for hands-on control 2560 x 1440 QHD resolution. Touch, tap, glide and make the most of Windows 8.1. IPS technology. 5th Gen Intel® Core™ i5-5257U mobile processor Ultra-low-voltage platform. Dual-core processing performance. 8GB system memory for advanced multitasking Substantial high-bandwidth RAM to smoothly run your games and photo- and video-editing applications, as well as multiple programs and browser tabs all at once. 128GB solid state drive (SSD) While offering less storage space than a hard drive, a flash-based SSD has no moving parts, resulting in faster start-up times and data access, no noise, and reduced heat production and power draw on the battery. Intel® Iris Graphics 6100 On-processor graphics with shared video memory provide everyday image quality for Internet use, basic photo editing and casual gaming. Bluetooth 4.0 interface syncs with compatible devices Wirelessly transfer photos, music and other media between the desktop and your Bluetooth-enabled cell phone or MP3 player, or connect Bluetooth wireless accessories. 3 USB 3.0 ports maximize the latest high-speed devices USB 3.0 ports are backward-compatible with USB 2.0 devices (at 2.0 speeds). HDMI output expands your viewing options Connect to an HDTV or high-def monitor to set up two screens side by side or just see more of the big picture. Built-in media reader for simple photo transfer Supports SDHC and microSD memory card formats. Wireless network connectivity High-speed wireless LAN built into the screen, so it connects to your network or hotspots on the most common Wi-Fi standards in both laptop and tablet modes. Additional ports Mini DisplayPort and headphone output. Intel, Pentium, Celeron, Core, Atom, Ultrabook, Intel Inside and the Intel Inside logo are trademarks or registered trademarks of Intel Corporation or its subsidiaries in the United States and other countries.